The Tour du Mont Blanc is a big trek and requires a good deal of planning in order to complete it comfortably. We have run TMBs for many years and believe we have the best Guides and work with the best hotels on the trail. Many clients are often pleasantly surprised at the quality of the hotels. The team at Salamander Adventures have been organising adventure travel for over 30 years and have run treks in the Alps since 2007. Our key people have a wealth of experience, working at senior levels for major adventure companies including Exodus, Explore and Trailfinders. The trekking guides have a great deal of knowledge and information and many live locally – mainly in Chamonix, Annecy and Courcheval. All the trekking guides at Salamander Adventures are qualified and experienced leaders. They are all members of the British Association of International Mountain Leaders (BAIML) or the French equivalent, Syndicat Nationale des Accompagnateurs en Montagne (SNAM), and of the Union of International Mountain Leader Associations (UIMLA). 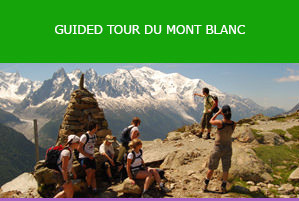 This is the highest qualification for trekking guides, recognised worldwide and is a legal requirement on the Tour du Mont Blanc. The trekking guides have thorough and extensive mountain training in addition to the history, geography and geology of the Alps. We have an office in the UK and in Chamonix. In Chamonix, we have built very strong relationships with local hoteliers, transfer companies and trekking guides. Our location in Chamonix also means we are always there to provide any assistance you may need during your trek in the Alps. We offer guided and self-guided options. Guided trips are a full package and include the hotels, most meals, luggage transfers, airport transfers, cable cars and the trekking guide. The maximum group size is 14 clients. For the self-guided option, we will book your hotels or lodges, provide Route Notes and arrange luggage transfers between hotels. We offer a budget version using refuges and an upmarket version where most of the hotels have comfortable rooms with attached bathrooms. If you opt for a guided Tour du Mont Blanc, the trekking Guide will set a reasonable pace, but it will never feel rushed – it is a holiday, after all! Each day has plenty of time built in for photo opportunities and rest stops, either on the trail or at a mountain café. The trekking Guide may encourage the group to spread out and go at their own pace or keep them together if the weather is poor. Your safety and enjoyment of the trek is our priority. Your money is safe when you book with us. The money you pay is held in a trust account by the Travel Trust Association until your tour is completed. Only then can we access the funds. We do not operate through middlemen such as travel agents and so the price is clear and no one is receiving commission. Phil has worked as a trekking guide for over 20 years. Leading for Exodus and Explore, journeys took him to Everest Base Camp, Mount Toubkal, the Karakorum Highway and unexpected meetings with the Tajik Mujahidin. He also worked for six years at Exodus’ Head Office as a senior member of staff before heading to Chamonix and setting up Salamander in 2007. A keen mountaineer, who has climbed 6, 7 and 8000m peaks, he spends his free time trekking and cycling. Natalie was a sales consultant at Trailfinders for three years and at Exodus for two years. She then qualified as a secondary school art teacher and spent eight years teaching and running school trips in the UK and abroad. Natalie spends much of her spare time walking: her favourite areas are the South Downs, Amafli Coast and the Mont Blanc range. She has travelled extensively around the world. Simon has lived in the French Alps for over 15 years, spending most of that time exploring, walking, climbing and guiding. He works all year round guiding treks and snow-shoeing. 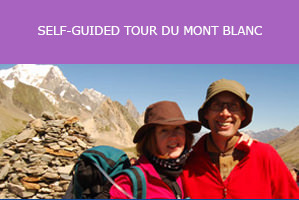 Simon is an accredited guide for the Reserves and Espaces Naturelles of the Mont Blanc region. During winter he is a Avalanche Safety instructor for the French avalanche research association and during his spare time a trainer for the local ski race club. Peter Smith is an International Mountain Leader who has loved being in the mountains since his early childhood. Having lived in Chamonix for 16 years, Peter has a detailled knowledge of the TMB and the surrounding area. In the winter months he enjoys cross-country skiing, snowshoeing and ski touring on his telemark skis. However, when the snow melts, Peter can be found climbing and trekking around the Mont Blanc region, or relaxing in his vegetable garden. Originally from Leicestershire, Neil started rock climbing and mountaineering at a very young age and has been exploring mountains ever since. He has climbed tough mountains all over the world and trekked to the top of many summits including Kilimanjaro and Pic d’Aneto. As a mountain leader he has worked extensively in the Alps, Pyrenees and Africa. Based in the Alps, he is also a ski instructor and works as an Off-Piste & Mountain Safety Assessor. Susie is an International Mountain Leader who has loved journeys in the mountains since she did her first ‘expedition’ on the Duke of Edinburgh’s Award scheme aged 14. Since then she has spent 30 years exploring on all five continents and has a taste for deserts as well as mountains. Susie speaks French and Spanish and enjoys learning about the local culture where ever she is, especially the food and drink of an area. In the winter she loves continuing journeying through the mountains on skis, seeking adventure in the back country. Susie has been leading trekking groups for the last 10 years; in India, Nepal and South America as well as in the Alps and Dolomites. Luke is a qualified International Mountain Leader with 10 years experience leading groups around the world including the Alps, North Africa, South America, Asia and the Middle East. With a background in Outdoor Education and Development Training, he enjoys teaching people about the natural environment and helping them to achieve their goals in the outdoors.